We hope you will find it helpful and we are always happy to receive feedback such that we can make these guides even better. 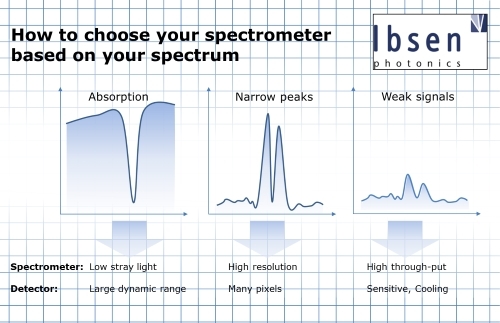 The basic parameters you need to know before choosing a suitable spectrometer are wavelength range and resolution. But, even though you know your wavelength range and resolution there are still a lot of possible spectrometer design options. Your final choice of spectrometer will depend on the importance of parameters such as overall size, cost, speed, sensitivity, signal-to-noise ratio, dynamic range, linearity, thermal stability and robustness. In our technical note, you can find some general guidelines that may help you determine what kind of spectrometer parameters you should focus on for your application. This guide provides some simple and easy to use design guidelines and formulas for designing, evaluating and comparing various diode detector array, diffraction grating based spectrometer designs. We list the basic equations for designing a spectrometer in this step-by-step tutorial. It works equally well for transmissive and reflective spectrometers. We use it extensively for feasibility evaluation, so we thought it might be useful for you as well. Please click here to read the full Spectrometer Design Guide. You probably from time to time need to do some quick evaluation of various optical designs for a spectroscopic system. And you don’t want to spend days on running a full numerical calculation in a tool like Zemax. Very often, you need to cover a specific wavelength range with a certain resolution and want to evaluate how different detector widths, grating groove densities and image magnifications will affect your focal lengths and slit sizes. To do that, we have created a handful of calculators that we ourselves find very useful.